Most of my friends told me to read Princess Jellyfish (what a name!) by Akiko Higashimura and I ignored them. After reading the first two volumes of her next project Tokyo Tarareba Girls, I can say they were right. My bad. Ms. Higashimura's new series, Tokyo Tarareba Girls, is a good romance serial. I'm invested in the characters and their struggle. Admittedly, they're three thirty-ish year old Japanese women and their struggle is finding a husband before the Tokyo 2020 Olympic Games. I enjoyed the romantic comedy. I enjoyed the pathos of a true gut check around age thirty. I also enjoyed that it leaned at least a little into Japan's sexist belief that an unmarried woman older than 25 is past her prime. Tokyo Tarareba Girls is funny in translation. Humor is difficult in comics to begin with. It's an order of magnitude harder when you're moving from one kind of language to another. Also, props to the translation team for a well done translation notes section. Putting the panel in question next to the note helps. To return to the work, the plot's good, and Volume 1 ends on an intelligent reversal. Volume 2 places each of the three main characters into deep figurative water. Volume 3, I imagine, will show the dangers of that water and those three women continuing to drink heavily. Ms. Higashimura also knows when to completely exaggerate the effects of a conversation. For a manga that's largely about the interior lives of persons and therefore visually unspectacular, it's amazing that even with my short attention span I never once got bored. Tokyo Tarareba Girls is largely a comic about people being in rooms and talking. An artist has to be really good to make that work. Ms. Higashimura made it work. 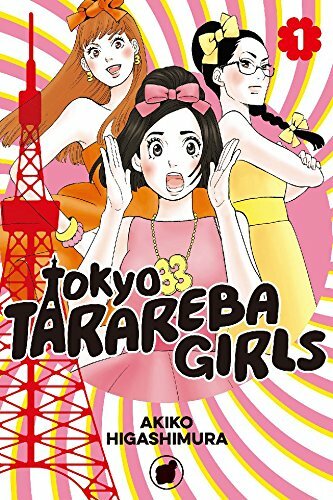 In the bonus section to Volume 2, Ms. Higashimura tells the story that her unmarried friends viewed the series as a horror manga, which is precisely the group that Tokyo Tarareba Girls is about. Those "what if" women that wonder about a previous lover that wasn't right for them or an imagined greener pasture. Tellingly, the first big story in Volume 1 is about just that. I posted the first page story on Instagram, and like clockwork, two of my friends went bananas. They know the genre, and they know there's plenty of it. But they also knew, from just one page, who the author was and that they had to read more. Maybe you will too. Kodansha hosts a meaningful preview of the work here.